Setting aside Vermont's round barns, the West Monitor Barn in Richmond is surely the state's loveliest, its raised central portion of roof - the monitor - elegantly backed by rolling hills. The Vermont Youth Conservation Corps restored the stately but ailing, century-old structure and then moved in two years ago. Since then, the environmental and conservation training nonprofit, which has employed 16- to 24-year-olds since 1985, has been able to do more watershed-seeding, bridge-building and trail-resurfacing than ever before. Saturday night's shindig was the VYCC's second annual "Denim & Diamonds" fundraiser in support of these efforts. The event accommodated Vermonters' preference for dressing down but provided plenty of opportunities to show off one's carats - or, more often, costume jewelry - while bending over a silent-auction bidding sheet or stacking up plastic gambling chips.The event was sold out, prompting President Thomas Hark in his welcome address to proclaim himself delighted that Vermont's best-kept secret, the VYCC, was now out. Dinner was prefaced by a slide show of smiling young faces and participant testimonials about hauling staggering amounts of construction materials, forming lifelong friendships, and - the VYCC theme - learning to take responsibility for all one's actions. All of which seemed somewhat at odds with the evening's focus on gambling. 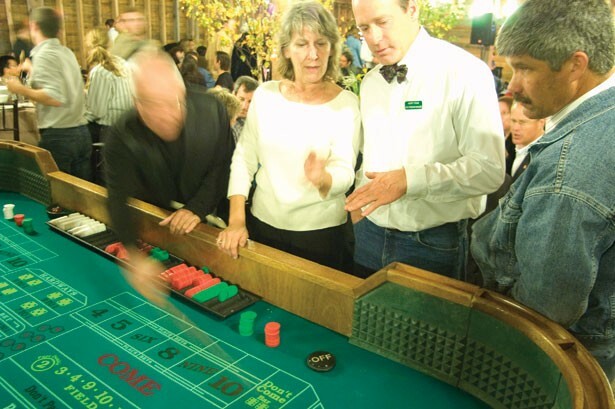 After passing around the baked pumpkins filled with creamed root vegetables, guests scattered, either to the dance floor, where the Chrome Cowboys had begun strumming, or the craps, roulette and blackjack tables to spend the fake $50 bill inserted into each menu. Our blackjack dealer, a twentysomething VYCC participant, admitted she didn't know much about the rules. Such skills aren't exactly necessary to clear brush for the Cross Vermont Trail, an alternative-transportation route the youth organization is building from Burlington to Newbury. That's just one of the group's many projects destined to make outdoorsy Vermonters happy.